Check Point Software is scheduled to report first-quarter earnings results before the open on Thursday. The sentiment toward the stock is extremely pessimistic ahead of the earnings release. The overall fundamental picture is above average while the overall price performance has been well above average. 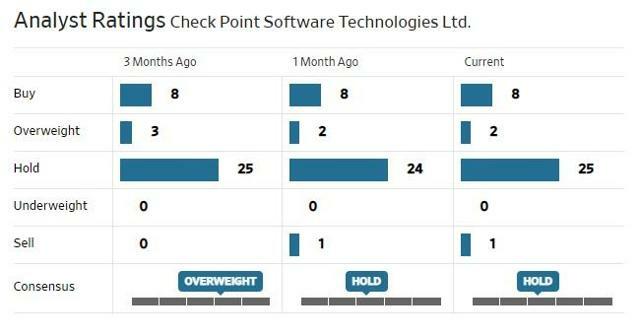 Security software firm Check Point Software (CHKP) is set to release first-quarter earnings results before the market opens on Thursday and the sentiment toward the stock is extremely bearish at this time. Analysts expect the Israeli-based company to report earnings of $1.31 per share on revenue of $471.09 million. The company earned $1.30 per share in the first quarter of 2018, so earnings are expected to grow by a penny per share on a year-over-year basis. Over the last three years, Check Point has seen its earnings grow at a rate of 12% per year and the company saw its EPS grow by 6% in the fourth quarter. Sales are expected to grow by 4.1% for the quarter and that is right in line with the sales growth in the fourth quarter. Sales have grown at an annual rate of 6% per year over the last three years. While the earnings and sales haven’t grown as well as other companies in the software industry, the company’s management efficiency ratings are well above average. Check Point boasts a return on equity of 24.7% and a return on assets of 10.1%. The profit margin is at 56.4% and the operating margin is at 47.7%. 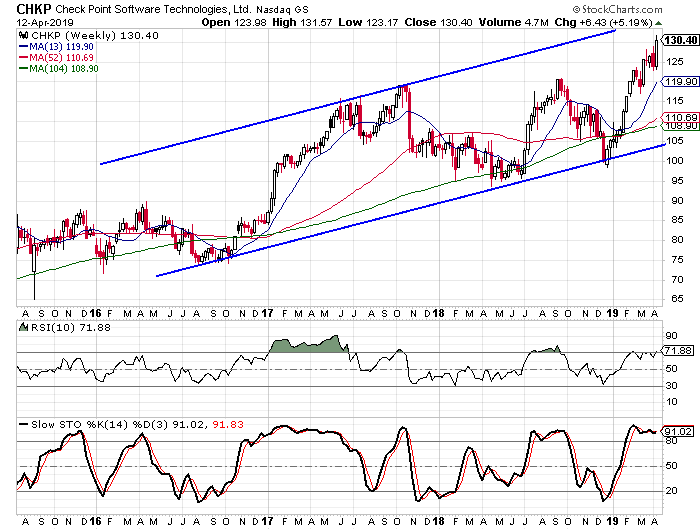 It is also worth noting that Check Point doesn’t have any long-term debt at this time, and if we do see a global economic slowdown, it can help a company cope with slower sales if there aren’t any long-term debt payments to be made. Check Point has been able to grow its revenue incrementally over the last four years, growing revenue from $1.4 to $1.5 and then $1.6 and $1.7 in 2018. Looking at the overall results of the fundamental measurements of the company, Check Point has been pretty solid in the last few years. However, the chart is even more impressive in my opinion. The stock consolidated between $105 and $95 during the first half of 2018 before it broke out in the third quarter. The stock then retreated with global stocks during the fourth quarter, but it has rebounded in an impressive way. From the December low to the close on April 12, the stock is up 32.3%. A rather wide trend channel has formed on Check Point over the last few years, with the highs from mid-2017 and late 2017 forming the upper rail. The lower rail is formed by connecting the lows from 2016, the first half of 2018, and the low in December. The stock isn’t quite up to its upper rail yet, so it could still have some room to move up. The rally off the lower rail from the low in December has moved the weekly stochastic readings from oversold territory to overbought territory. The 10-week RSI wasn’t quite in oversold territory in December, but it has reached overbought territory at this time. Looking back at the beginning of 2017, we see that both of the oscillators were in overbought territory for almost the entire first half of the year. When I started researching Check Point for this report, I was shocked at how bearish the sentiment was and that got me excited to write about it. There are currently 36 analysts following the stock and only 10 rank the stock as a “buy”. There are 25 “hold” ratings and one “sell” rating. I have mentioned it many times before, but it is worth repeating. When a company has solid fundamentals and a decent looking chart, we usually see 65 to 75% of ratings in the buy category. For Check Point, only 27.8% of the ratings fall into the buy column. The short interest ratio is also showing extreme pessimism toward the stock with a current reading of 8.9. The ratio has been elevated for several months now with readings above 7.0 since the end of October. The number of shares sold short has remained relatively constant over the last five months, with the number of shares sold short holding between 7.2 million and 8.5 million. The ratio has vacillated more because of the average daily trading volume as a result. The put/call ratio for Check Point is also showing signs of pessimism. There are 15,259 puts open at this time and 10,754 calls open. This puts the ratio at 1.42 and that is well above the 1.0 level that I consider a sign of pessimism. The value of the high ratio does lose a little relevancy when we consider that the total open interest represents less than two days of average daily volume. What we see from the sentiment indicators is a great deal of pessimism toward Check Point and that pessimism doesn’t seem to be warranted. The only areas where the company is below average are the earnings growth and the sales growth. I see lots to like about Check Point as a long-term investment. The overall fundamentals are strong, the price performance has been better than most stocks, and the sentiment is far more bearish than it should be. The biggest concern I have is the overbought levels on the weekly overbought/oversold indicators, but as I pointed out, those indicators were in overbought territory for the entire first half of 2017 and the stock kept rising. Check Point has beaten its earnings estimates in each of the last 10 earnings reports, but that hasn’t always led to a jump in the stock. In the last year, we have seen a gap higher, a gap lower, and two relatively muted reactions. When it gapped lower, the stock consolidated for a few months before taking off. When it gapped higher, the stock pulled back a few days later. Given the reactions to earnings and how the stock has performed in the days following, I don’t think you have to buy Check Point ahead of the earnings report. But given the extremely negative sentiment readings, I think it is far more likely that the stock moves higher after earnings. If you are looking to trade it, I would look to go long with some call options. If you are you looking for a long-term investment in the stock, I would wait until after the report to buy the stock. If you would like to learn more about protecting and growing your portfolio in all market environments, please consider joining The Hedged Alpha Strategy.